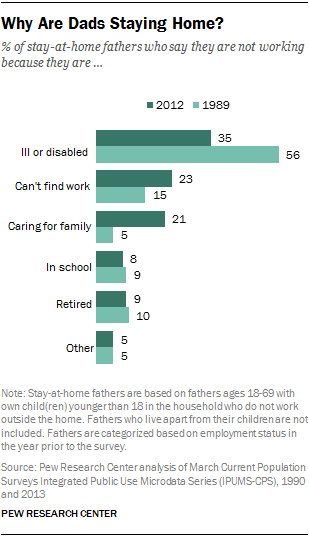 The biggest share of stay-at-home fathers is out of the workforce due to illness or disability. About one-third (35%) fall into this category. This share is down substantially from 1989, when 56% of all at-home fathers reported that they were home for this reason. The decline in this category has been supplanted by increases in the share of fathers who are home to care for their family, or because they couldn’t find work. In 2012, roughly one-in-four fathers who lived with their children (23%) reported that they were at-home because they couldn’t find work. This number was 15% in 1989, fell in subsequent years, but spiked dramatically in the wake of the Great Recession; by 2010, fully one-third (32%) of at-home fathers said they were home mainly because they could not find a job. Since that time, the share of stay-at-home fathers who can’t find work has been dropping notably. Smaller spikes in the prevalence of fathers who were unable to find work occurred during the recessions of the early 1990s and the early 2000s, as well. While the inability to find work is one of the primary reasons that fathers who live with their children give for being at home, it has not been the only driver of growth in the number of at-home fathers since 1989. In fact, the biggest increase in fathers at home has been among those who are caring for their family; this number rose by 377,000 since 1989. Fully one-fifth (21%) of stay-at-home dads say that they are at home primarily to care for their family; a four-fold increase since 1989, when just 5% of at-home fathers said as much.7 This increase has been the result of steady growth across the decades. Smaller shares of stay-at-home fathers report that they are not working either because they are in school (8%); retired (9%); or for some other reason (5%). Unlike stay-at-home fathers, the majority (73%) of stay-at-home mothers report that they are home primarily to care for their children. Just 11% of stay-at-home mothers report that they are home due to illness or disability (compared with 35% of fathers). And 6% of stay-at-home moms say they are at home because they could not find work.